I am so sorry for not writing for so long. I have been quite busy baking cakes for my husband and a friend and then there was a family dinner we were hosting for my husband’s birthday and the list goes on. I have been asked to write my recipe for my ensaymada and meringues and I will, don’t worry. 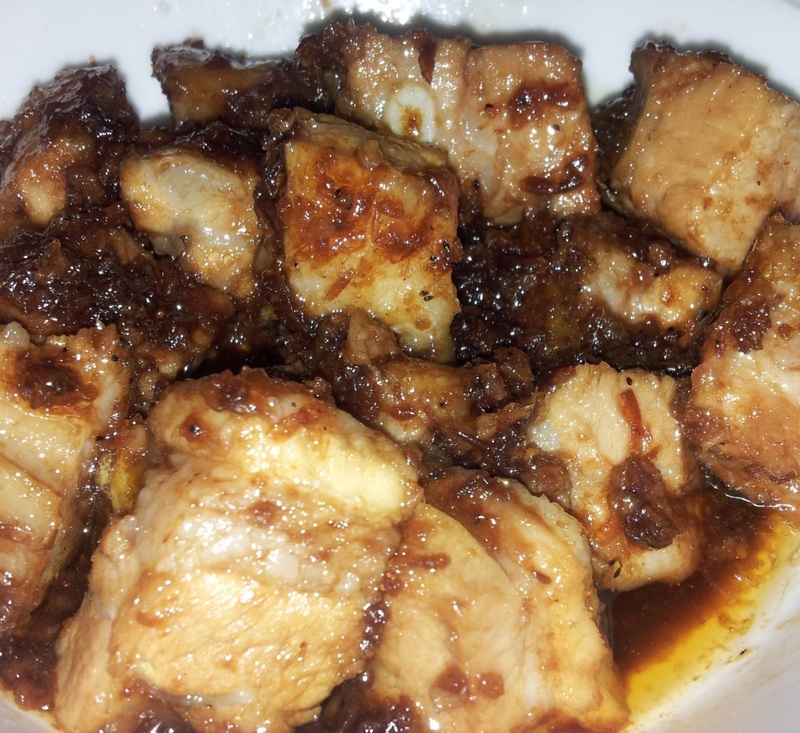 I just want to write my recipe first for my Crispy Pork Binagoongan which we had last night after some last minute deciding haha. I need to write it down before I forget what I did. That’s my whole purpose of having a blog. To have a record of things and events, and in this case my recipes. I print them and file them, and so everytime I am in a quandary as to what to cook, it is easy to go through what I have already tried and tested. Warning though, this involves a turbo broiler but you can make do without it if you are willing to fry your pork belly until crispy. I am not very keen on doing that because I hate popping hot oil and the massive clean up. At least with the turbo broiler, everything is contained inside that huge glass bowl. As I have said, you need to crisp up your belly. You can either cut them into serving pieces, boil them in a cup of water until the water dries up, add oil and continue cooking until crispy, or buy from an Asian Store one of those cooked roast pork with crispy crackling, or do it my way. I am not happy to fry or to buy cooked, so I didn’t. I took what could probably be a longer way. I covered my pork belly (not cut yet) with water in a large pan, added about 1 tablespoon of salt and boiled it for about 1 hour. Drained the pork and transferred to my turbo broiler skin side up. Set it on 225 deg C and turned it on for an hour or so, checking once in a while to see that it is crisping up and not burning. By then, you are already tempted to just eat it this way, but then I really want binagoongan! When it’s nearly dinner time, cut up your cooked pork belly into serving sizes. Set aside. Open up all your window for the next step :). In a wok or a frying pan, put a bit of oil and sauté your garlic until they turn light brown and crispy. Add 2 tablespoons of water and your vinegar. Add the bagoong, sugar and cayenne or chilli if you are using. Hear your tummy rumble at this time. Add to this mixture your cut up pork belly and just stir around to coat for about 2 minutes. Another sinful thing to eat. P.S. Sorry about the photo. I nearly forgot to take one and I had to take this one as quick as I could 🙂 because we were already in the middle of dinner.